THE weatherproofing of house walls is an important factor in house building and one of the early essentials in the building up of the walls is the inclusion of a damp-proof course, a short distance above ground level. The conditions and manner in which the damp-proof course is laid will vary in accordance with the type of wall construction. The materials employed for the damp-proof course may be of lead or copper sheets or bituminous covered lead, slate or a bituminous composition. Apart from this essential, and the natural weatherproof qualities of good brickwork, perforated air bricks or gratings are situated about the same level of the damp-proof course to give free ventilation, particularly suitable in cavity walls, I.e. walls which have an air space running vertically through the height of the wall. Such walls often possess similar air bricks or gratings at the tops of the walls just below the eaves of the roof. The layers of mortar between the bricks are also treated in a special way so as to reduce saturation of brickwork by moisture. 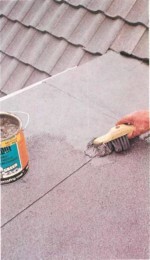 The damp-proof course prevents the rising of ground moisture. The air bricks ensure a free passage of ventilating air, and the treatment of the mortar by pointing accelerates the clearance of surface moisture. Other factors enter into the effec- tive weatherproofing of brick walls but for the purpose of this entry the foregoing description has been simplified to suit the type of repairs referred to in the following paragraphs. Dampness in brick walls may arise from one or more of several different conditions. These may be categorized as follows: (I) Deterioration of materials, mortar, brickwork, damp-proof course, and joints between wall and windows, doors, sills, etc. (2) Obstructed ventilation of wall cavities. (3) Inferior or badly laid damp-proof course, permitting moisture to rise from ground level, defects which may involve major repairs. (4) Inadequate ground drainage, I.e. waterlogged soil, penetration of moisture through walls due to cracks or high porosity of walls. (5) Roof leakages which pass the full volume of drained moisture on to the wall and cause the accumulation to drain downwards in the wall. (7) Walls which, for example, surround a courtyard, and from lack of the drying action of sun or wind, lend to retain a high content of moisture. (8) Frost, the effects of which tend to cause deterioration of wall surfaces. Some of the methods for countering these and allied defects are described hereunder. The best occasion to select for the weatherproofing of walls, the surfaces of which have deteriorated, is, of course, during a spell of fine dry weather, because all walls retain a certain amount of rainwater or atmospheric moisture. Thoroughly air the rooms of the exterior walls to be treated. There are several very good proprietary brands of weatherproofing liquids, which may be brush-applied to external walls; some are transparent, while others incorporate a colouring agent natural to the material employed. Chief among the weatherproofing liquids are silicate of soda (transparent), paints with a silicate base, bituminous compounds, oil-bound distempers, whitewash, limewash, and gloss oil paints. The application of such weatherproofing agents is similar in method as for those described in the general instructions on INTERIOR DECORATION. They may be brush-applied or sprayed, but as the latter method involves expensive plant the handyman is confined to the former method. Cement slurry with a high sand content is often a useful weatherproofing agent in the treatment of cracked or eroded surfaces, but is not an entirely satisfactory covering and will flake away if the cement content is too high. If a waterproofing of the walls by one of the foregoing methods is considered necessary it will first be advisable to give some attention to the pointing of the brick mortar, before applying the waterproofing compound. Increase in porosity of mortar courses may be countered by the periodical painting of mortar. No. 6 ‘Flat Flitch’ is a good brush for this purpose. The cause of dampness may be due partly to inferior mortar or its deterioration from another cause. In any event, if the mortar between bricks shows definite signs of erosion and looseness rake out the affected section with a small pick, to a depth of about 1in. As an alternative to this, the mortar may be removed by hammer and a small cold chisel. Examine the layers of mortar to see which type of pointing method has been adopted. There are two varieties of mortar for pointing; one is oil mastic, a stiff paste of fine sand, red lead and boiled linseed oil. The red lead is a strong colouring agent and therefore influences the selection of this mixture where appearance is also a consideration. Oil mastic is efficient. Cement Mortar. A stiff mixture of one part by volume of Portland cement to four parts of fine sieved and washed sand in water. 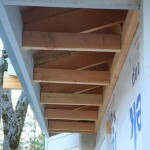 A small addition of lime will improve its smooth working qualities. Mix on a board, clean surface or bricklayer’s hod or hawk. After raking or hacking out the mortar along the affected sections, brush away all loose mortar dust and prepare the pointing material. Before applying cement mortar thoroughly wet the interstices of the wall. This is necessary otherwise absorption of moisture, by the wall, from the cement mortar will make re-pointing difficult. Use a brush to wet the mortar courses. This precaution is not to be adopted for repointing with oil mastic, linseed oil priming being used. The mortar or mastic is applied to the interstices by a small pointing trowel. Finish the surfaces flush with the bricks; then use the jointing trowel or a small pointing trowel. Point the mortar in the usual way, remembering that the slope of the pointing for horizontal courses should be outwards and downwards. Then, using a straight-edged board and the trowel, trim away surplus material from the lower edge of the pointing. If the straight-edge is held a little away from the wall by a thin block of wood at each • end (nailed to the straight-edge) so as to allow the waste material to fall away—so much better for the working results. The mortar can of course, be pointed by making the surface a curved or V-shaped concave, but these are more difficult of execution. Irregular courses may perhaps be best pointed with an ordinary trowel. Where cracks are evident in the brickwork, of such a nature as to cause dampness, these may be filled with the aforementioned mortar or mastic. If heavy erosion or deterioration of brickwork has taken place, new bricks may be replaced after removal of the old ones, but the utilization of this method is obviously somewhat limited in scope. Excluding the possibilities of serious dry rot in the woodwork, as a result of dampness where leaks between joints of wall and frame occur, the use of oil mastic can be very satisfactory. If the gap is large, pack with painted wood strips or wedges and fill the gap to within 1 in. of the wall outer surface, then point up with the cement mortar or oil mastic as required. In instances of bad decay of wood, removal of the defective woodwork is the only sound remedy to be considered. In general, gutters and gutter drain pipes, either of which may become defective, are the main causes of downward filtering moisture in a wall. These should receive careful attention. 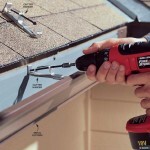 All roof leaks must be attended to at the earliest opportunity . If earth or refuse are piled up against air bricks, say, for example, during garden digging along a wall, air ventilation of the brickwork will be reduced and damp may rise over the damp-proof course. The air bricks should therefore be clear of any obstruction likely to encourage the accumulation of a high proportion of moisture or rainwater. Rainwater butts should be mounted on grids and be at least 2 in. away from the wall. They should not be permitted to leak. Where damp patches appear on external walls adjacent to the ground level look for the cause and, if practicable, dig in the earth a slanting trough, away from the wall, and fill with loose small rubble mixed with a little earth. Do this only if no logical cause other than ground dampness or waterlogging of a local nature can be found. Sweating or condensation of hard impervious bricks or other surfaces will respond to any efficient measure for increasing the 22Z2EE2ET?£EiSSIZIZiIS free flow of air over the affected surfaces, but as this is not always possible owing to the location of the surfaces, as in courtyards, the use should be made of one of the paints specially prepared for use in such conditions, I.e. one which will discourage the absorption of moisture or its formation on the surface. 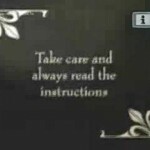 In serious instances the advice of a builder should be sought. Brick walls that have been rendered by a protective layer of cement frequently develop narrow cracks and crevices without any undue deterioration of the material. These cracks and crevices should, of course, be filled with cement mortar. Where there is evidence of deterioration of the material by loosening away, bulging, or powdering, the defective area should be hacked away and the mortar courses raked out as previously described, cement mortar being laid ; large areas being trimmed flush with the surface by a straight edge. When applying more than one thickness of mortar, key the top or joint surface by scoring to increase adherence of the next coat. On some wall surfaces where natural keying does not exist, such as may be found where timbers are set flush in the wall, an artificial or superimposed keying is often employed to facilitate rendering. This type of keying is quite frequently of special expanded sheet metal or heavy wire mesh. This should be brushed clean and thoroughly damped before the application of new mortar. In some instances wood surfaces may be keyed by the liberal use of large head or clout nails. These are driven into the surface at close intervals, but the heads of the clout nails are not driven flush with the surface. They should be approximately gin. To½ in. clear of the surface to provide a good key.